In the past I've always mounted the pan ears to the frame "by the book" using the hard wood blocks, horizontal bolts and the vertical bolts. Its been suggested to me recently that I should ditch the horizontal bolts and wood mounts and add a spring between the pan ears and the top of the frame and let the mountings float. Apparently this reduces vibration and harshness. I'm keen to hear your thoughts on this. The horizontal bolts holds the engine horizontally. Forces from the rear wheels will try to push the engine sideways and since the pan ears are flexible they may break eventually if nothing at all helps them from flexing sideways. Tightening the horizontal bolts too tight to the wood blocks is also bad and may chrystallise the ears according to Ford, so the best solution may be if you have an improved style engine with the diagonal straps from the hogshead to engine bolts down to the vertical pan ear to frame bolts. The straps will keep the engine from flexing sideways and wood blocks won't be needed. That's how Ford mounted TT engines during 26/27. 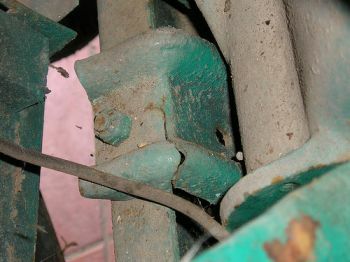 Both the front and rear radius rods attach to the crankcase. The torque of the engine and the internal brake. All these forces will tend to move the crankcase front to back and side to side. It could also rotate the crankcase if the brake is pushed hard. 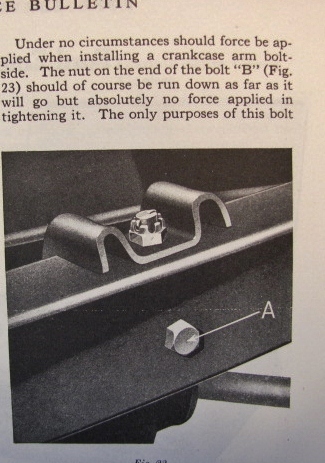 I personally think it is much safer to use the mounts as originally designed by Ford. Don't over tighten the horizontal bolts. 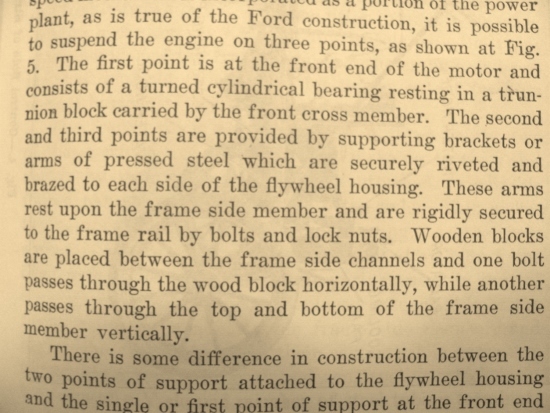 Have always used the Ford way, with a tight fitting wood block between the pan ear and the inside channel of the frame. Run down nuts on the long horizontal bolts to get snug only, no wiggle, and line up cotter hole without being tight. The vertical bolts and nuts get tight, and cottered. Now haven't seen anyone put a 'spring' on the frame rail and then place the pan ears, can't believe that would work at all. With the pan jacked up over the frame. Maybe as shown in the right side of the sketch, a spring on a replacement longer vertical bolt, ..........but that's not the Ford way. Guess those who use 'springs' on the pan ears don't use belly straps either! Its not my intention to do this, I was just asking for your opinions. I have always believed that the pan, ear to ear, was also a pseudo chassis cross member and therefore required being bolted down solidly. Thanks for your answers and the link to the old thread. Just post and opinions will appear rapidly in type! The Ford is so simply and elementary design and manufactured with quality materials,.... one thinks up easily ways it can or could be 'improved'. Victor W.Page, M.E. 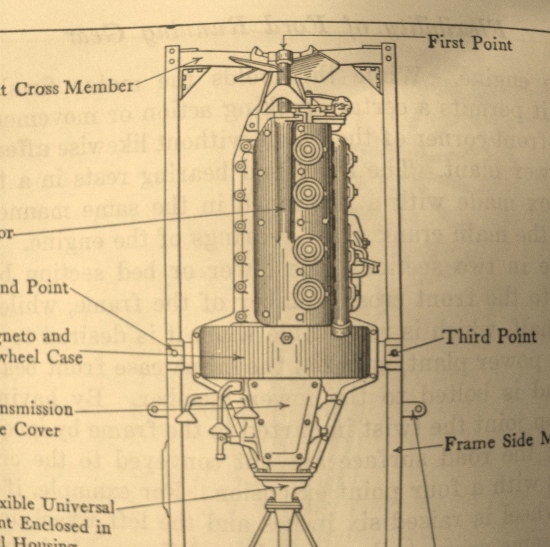 was an early automotive authority, and he wrote on the Ford's Famous 3-Point Suspension design. A typical early chassis with motor and separate speed change control (trans) used a 4-point mounting method, 2 motor mounts on each side, bolted tight to the frame. While strong, this method is also non-flexible, and any wrack will cause problems in bearings, or other things. Example below of a 4-point mount. 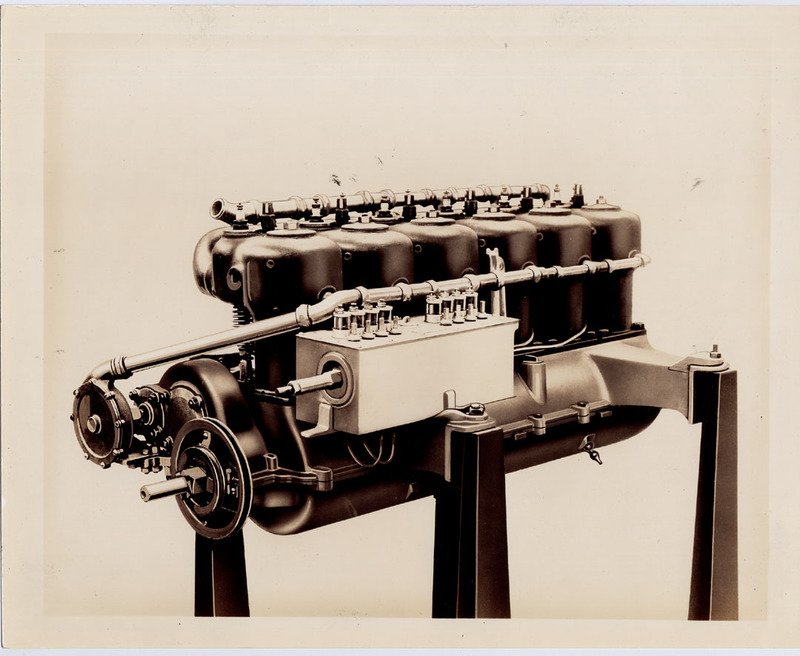 But with the Ford T, the 3-Point is used as the power plant stays in place, when the frame or suspension moves. Example Page notes is if the right front wheel is raised 6" and the left front wheel is dropped 6" (happens when you hit a pot hole or ditch), the front cross member moves on the crankcase bearing (First Point), but does not twist the motor to any extent from horizontal, due to the Second Point and Third Point fixation. As noted by Page, the crankcase motor supports (pan ears) are to be rigidly fixed to the frame rails. A fellow chapter member wondered what the vibration was all about at certain speeds. I drove his car, not knowing what he had done, and asked him if he had removed the wood blocks & side bolts. He read some article somewhere telling him to do it. I explained the purpose of those items. He put it all back to original and has left it that way ever since. It will ultimately cause cracks in your pan arms. I have run pads made from conveyor belting under the arms and under front motor mount with spring loaded bolts for fifteen years or more on all my cars. No horizontal bolts or wood pads. The front mount is bolted as factory. Never have had a problem nor expect one after running for extended time. Just be sure to check during your annual inspections of the running gear. You may find this when the horizontal bolt is missing. Makes for more flex on the pan arms if the wood block and long bolt is gone. Of course Ford stated to not tighten the horizontal bolts too tight, they knew about flex there, and might cause fracture due to the side mounting being too tight, the head of the bolt causing stress crack. The wood block is there for some forgiveness, but the hard maple block is also providing support to the arm in twisting loads that the motor gets. But without long bolts, and wood blocks, to hold the pan arms spaced from the frame rail....well....picture shows. I can assure you that from this information, I wont be changing my method from the factory method. I was curious as to if it did in fact reduce vibrations and harshness. My car didn't come with wooden blocks, but instead has 3/4" pipe cut the distance from the frame to the pan that the bolts go through. 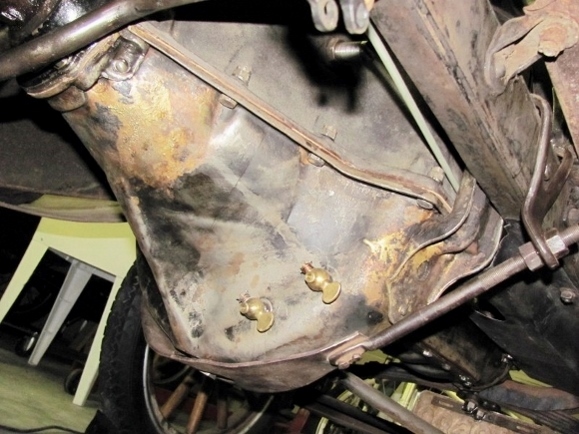 The late truck frames don't have the side bolt holes drilled in them for what its worth. A mate of mine runs a tractor repair business about 3km's from here. I've just returned from visiting his workshop. In the shop is a mid sized (Chinese built) tractor with a front end loader attached. Its suffered much neglect over the years and the bolts attaching the loader to the frame had all been loose, for a looooong time, with two missing completely. Because of all the flexing and excess movement, the tractor itself, actually broke in half....right through the bell housing. If everything had been bolted up tight, it wouldn't have happened. I suppose I can apply the same basic physics to Model T pan ears to frame mount.